How can museums employ new media to enhance their visitors' experience and their collections' accessibility? With the Internet moving into the public domain through wireless connections, broadband mobile telephony, and location-aware technology, museums are no longer bound by their physical limits (the building), but can use all relevant spaces, be it the city, the country or the public domain. Technology enables audiences to access, produce, and share media everywhere and at all times, and museums are quite far on in digitizing large parts of their collections. The combination of 24-hour on-line audience availability and rich digitised cultural musem content brings ample opportunities to create new cultural experiences. 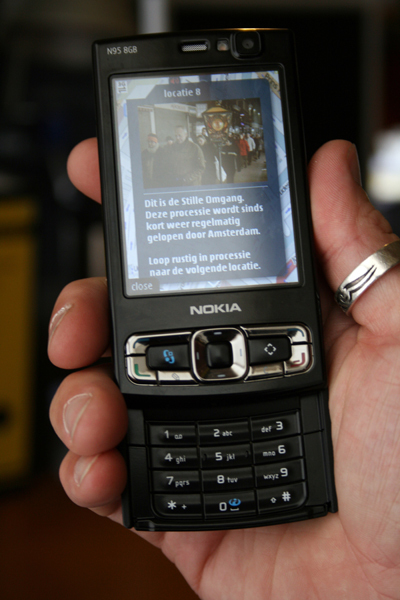 In this context, Waag Society recently developed a number of projects in which users are guided by mobile technology. The paper gives an overview of these projects and argues that the physical non-institutional environment is a great setting for appreciating cultural content and inducing active user participation. More and more location-based projects are being developed in the heritage domain. Although they are still relatively small in both number and in size, the impact of these projects on established cultural practices may turn out to be surprisingly great. The motivation to explore location-based projects lies in the (technical) developments that take place, as well as the opportunities they offer for heritage institutions to connect to (new) audiences. But location-based projects trigger a lot of questions within heritage institutions. Is this for us? (How) can we first stimulate and then deal with user participation? What technological choices are best in the long term? The actual user experience seems distant in these discussions. This paper describes the impact that location-based projects have on the users/participants, and analyses a number of the projects Waag Society has initiated. By offering this glimpse into our practice, the authors hope to further the discussion on the (im)possibilities of locative experiences in the cultural domain. With the emergence of the Internet and developments in digitization, museums and related organizations are forced to reinvent themselves to find and establish new and unusual alliances. The Internet is rapidly rearing its head in public space. With the advent of wide-band mobile phone with advanced positioning capabilities (TomTom principle), it is possible to produce, consume, and share media anywhere. People are always on-line somewhere,and know more and more how to take advantage of this. In addition, institutions are busy implementing the policies of the government regarding digitization of museum collections. In Holland, the 170Meuro project “Beelden voor de Toekomst” (Images for the Future) gives both space and money to do this right. This brings forward new opportunities for the experience of heritage museums. Where the collection was previously (arbitrarily) confined inside the walls of the museum, it is now possible to make it visible in other places where it is relevant: in the city, in the country, and in public space. The growing availability of digital culture, greater familiarity with digital media and increasing digital skills of the Dutch will stimulate the use of virtual cultural heritage. It is plausible that the balance between the different kinds of uses will change. The Internet is now mainly used as an information medium, but in the future, there will be more emphasis on the use for relaxation, personal development and communication and the formation of communities….. Finally, the emergence of many Web 2.0 applications leads towards the user taking a creative, producing role regarding cultural heritage. This will intensify the use of existing content and even more and new people will make use of virtual cultural heritage. The experts also expect a further rise of the mobile Internet, leading to place-independent network access. The interface is no longer (only) the PC; the laptop or mobile phone is the ideal tool. According to the experts, because of the emergence of the mobile Internet, cultural consumption is increasingly becoming a cross-media experience, which uses different kinds of media to stimulate a reaction or emotion with the viewer/visitor. In exhibitions or performances, for example, physical and virtual environments can alternate or overlap each other. An online game can help visitors to explore a museum and people can add information to an exhibition themselves. As mentioned, in this context location-based projects have started up all over the world, but heritage institutions - and their financers - struggle with the questions they bring to the table. The possibilities seem endless, the technology is not transparent enough for making choices, the costs are often high, the staff is not used to audience participation, the audience is aging, etc. Our own experience with location-based projects can provide new angles to a more user- and content- driven discussion. The Waag Society is an Amsterdam-based Media Lab that develops technology for social Innovation. The foundation was established in 1994 and continues to empower people to both express themselves and connect to other people. It works in the domains of Culture, Health Care, Education, Sustainability, and the Public Domain. 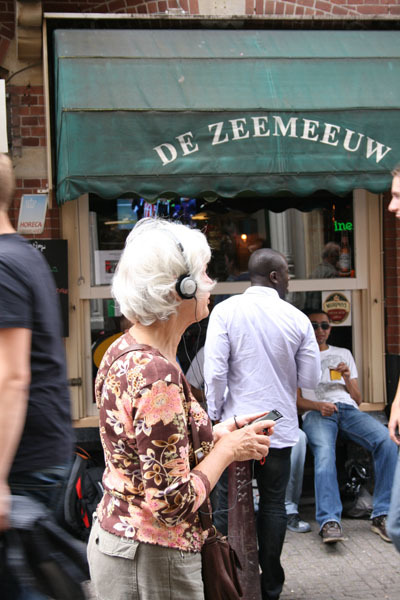 One of the key subjects that Waag Society has researched is the use of locations, and more recently, modern mobile phones, both in education and in cultural heritage. 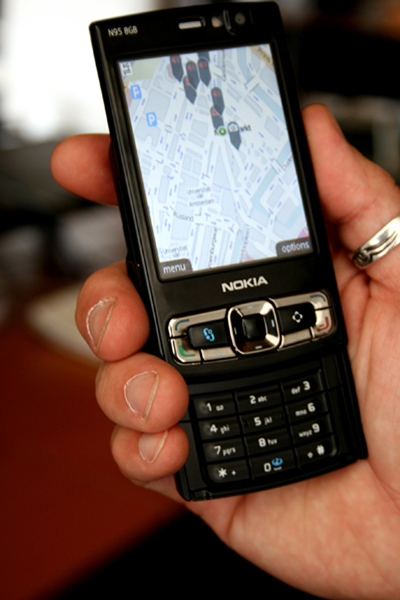 This research was set up in 2001 with Amsterdam Realtime, with users drawing a real time map of Amsterdam by tracing their routes with GPS. Amsterdam Realtime was a collaboration with artist Esther Polak and sparked several location-based projects. Some of these are detailed bellow. In 2005, the project Frequency 1550 was developed. 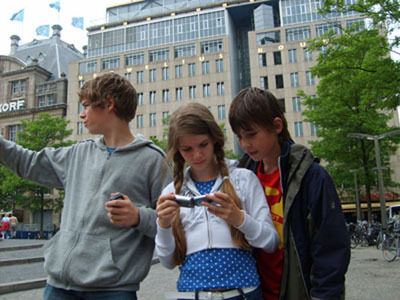 Frequency 1550 is a mobile city game that uses GPS and UMTS technology to let pupils of the secondary schools actively learn about history - instead of passively absorbing knowledge - by walking around and playing in Amsterdam’s city centre. The aim of Frequency 1550 was to bring the Middle Ages alive for pupils, within the context of their history lessons. The reactions were overwhelmingly positive, both with the participating schools and with a general audience. At that point, the technology was so new that, by itself, it didn’t attract the attention of a wide audience. Frequency 1550, however, made it to The Dutch TV News because of its innovative and applied character. For the pupils who played it, the technology was not the only attractive aspect. 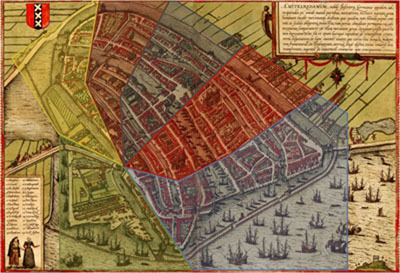 The impact of the experience was boosted both by the use of game elements and by the fact that they navigated the centre of Amsterdam on a medieval map. Looking at familiar surrounding with this different view provided the pupils with a strong experience, stronger than any textbook can provide. the feeling of an immediate contact with the past, a sensation as deep as the purest enjoyment of the Arts… you touch the essence of things, the experience of Truth through history. It is an experience often described as ‘immersive’; we like this definition even though it’s different from the popular use of the word immersive used to describe VR and theme park experiences, because of its link to the authenticity and personal nature of the experience, and because it’s small, a fleeting moment. As an example of an historical sensation, Huizinga asked the reader to imagine the following. You walk on the street, and a barrel organ [the well-known organ you find in the Dutch streets] is playing, and if you approach it, it suddenly happens that a breeze of recognition blows through your mind, as if for a moment you understand things which otherwise would be covered by the shrouds of life. Such fleeting moments of recognition help to introduce you into History more than any statistics or generalizations could do (Boone, 2008). Dutch historian and philosopher Frank Ankersmit (2005) elaborates on Huizinga’s comparison to the arts. ... our experience of a work of art is a quite specific situation and most fundamentally different from the epistemological situation that historians normally find themselves in when having to develop the most plausible hypothesis about what has happened in the past. All spatial and temporal demarcations have momentarily been lifted: it is as if the temporal trajectory between past and present, instead of separating the two, has become the locus of their encounter. Historical experience pulls the face of past and present together in a short but ecstatic kiss. Historical experience is, in this way, a surface phenomenon: It takes place on the surface or interface where the historian and the past meet each other. In other words, it is where the interpretation and experience meet each other. Is it the case that an active experience of history through the immersing qualities of a location-based game really adds to historical awareness, knowledge and appreciation of the city and its history, and enhances competencies such as the interpretation of historical sources and references? This question can be answered positively, according to Joost Raessens, Professor of New Media and Digital Culture (Raessens, 2006; and additional research by ILO and IVLOS on learning competences). As the concept of historical sensation seems to create an openness to enjoy history and a willingness to learn more about history, it is a powerful concept for cultural projects. In addition, the concept of such a strong sensation can have broader meaning as it can be defined as an experience, triggered by an unplanned, surprising, and maybe even magical moment, that somehow connects to you, in the way that art can do. The trigger can be an event,some music, an image - basically anything and everything. Apparently the historical sensation has a strong relationship with the present. It can give agency to cultural projects with a more general user group: we actively pursued this in the Rituals project. Rituals is a GPS-based walking route connecting religious monuments in a theatrical approach. The project was part of the activities that accompanied the European Year of Religious Heritage. In Holland, formal religions are in decline, while at the same time spirituality is taking a more important place in our increasingly individualistic society. Therefore we decided to target the personal and emotional level: the private (spiritual) experience of the participants. To achieve this, we attempted to combine the notion of an on-site historical sensation with the concept of storification. Storification involves not only experiencing a story, but also simultaneously making sense of the experience (Akkerman, Huizenga, Admiraal, 2009). Maybe we are capable of experiencing an historical sensation and at the same time relating it to our every-day life and making sense of it. Storification seems to ask for strong narrative organization and possibilities for internal structuring of the experience. As the goal here was to evoke personal reflection and active audience participation, the narrative was organised in a such way that participants could experience the power of rituals and share stories of their own, by using dramaturgical elements such as writing down a personal confession (whether big or small) at the start of the walking route and referencing that confession at several locations. The confession was written down in private in front of a huge mirror - which participants found powerful. 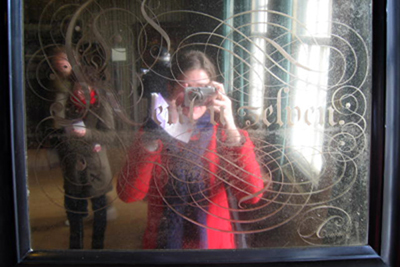 In addition, several mirrors were used throughout the route, as metaphors for personal reflection. In a church, participants listened to a (recorded) confession. In a Buddhist temple they burnt an incense stick while having to think about their own confession. 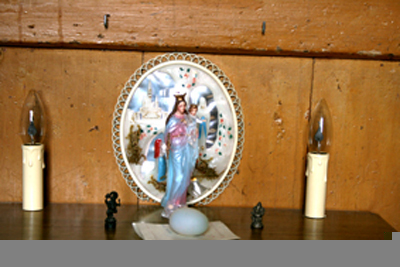 In the "hidden church" Onze Lieve Heer op Solder (Our Lord in the Attic, one of the oldest and most remarkable museums in Amsterdam), they created their personal place of worship. By carrying out these acts and by walking the route, a new ritual was introduced: distancing oneself from the confession, tossing the confession to the wind at the end of the route. In the end, the route brought about an exchange or dialogue that transcended religions and enabled people to experience familiar urban surroundings in a different manner. City Ragas is a visual cultural exchange game played on mobile phones. City Ragas was developed for the Amsterdam-India Festival that took place in November 2008. In November, throughout the city, cultural events that originated in India took place. With City Ragas we tried to set up contact between people from Amsterdam and Delhi, bringing the experience of Delhi to the streets of Amsterdam and the other way around - based on the exchange of user-generated content. On the Web, users are increasingly approached as content creators. Web sites like YouTube, Flickr, and MySpace are dependent on the input from the community. Without contributions from users there is no content and no linking between people. For mobile applications, it is also valuable to think about user participation. In the Rituals project, the participants knew that their confession would be kept secret; in City Ragas, the users’ input is central and public. 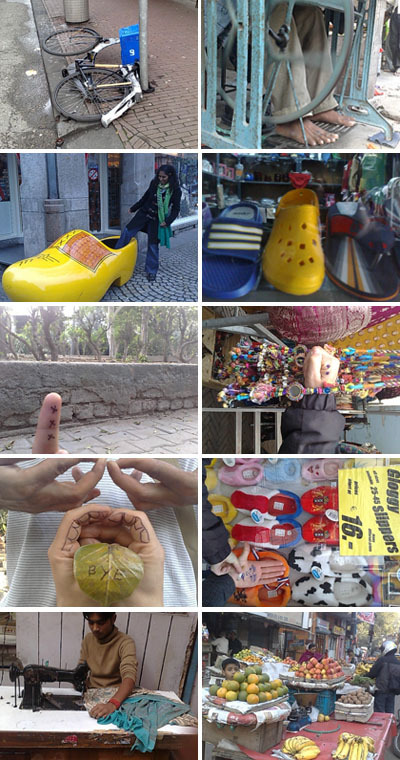 Within a given theme, participants in Amsterdam and Delhi made a photo story onsite. The acts consisted of photographing the city and responding to photographs from the other, unknown city. Players found it very special to receive a picture of someone else whom they do not know, from a distant land, a foreign culture - making the Amsterdam-India Festival very relatable on a human level. Empowerment of the users is important because it allows them to create “new forms of global awareness or connectedness that are not part of the global commercial media or consumption industry, nor part of a cultural elite of ‘high culture’” (Sassen 2006). It is often assumed that young people especially are interested in mobile applications. In Rituals, we deliberately aimed at a general, older audience. These elderly people were interested in the mobile application and mastered it much faster than we expected. This target group however differs from younger people in the way they react to and use mobile applications. Elderly people like to be guided by the application, they prefer to be told where to go, what to do, etc.... Younger participants like to determine what they do themselves. Also, they prefer to do things in their own order. It was found that young people tend to capture their own images more often. They are more inclined to be producers of their own content. The development of mobile applications specifically for the elderly, however, needs specific attention. Based on our experience with cultural heritage projects, we conclude that the physical environment is a great setting for triggering historical sensation, storification, personal reflection, and cultural exchange. Technical (locative) tools can further enhance this, linking history and personal or present-day experience. Looking back on the three projects described, we have moved from a technology-driven, very controlled situation (Frequency 1550) to an open system for content exchange (City Ragas), with a growing role for user participation. As we are dealing with interfaces between the fictional and the real, the urban and the virtual, as well as the interaction between street and ‘players’, it is a logical step to connect the locative experience to gaming and theatre and performance art, in order to trigger active user participation. Critical design practice should investigate the scenarios and dramaturgies that are necessary for a general audience to assume an active and independent role. Also, the connection of this type of project to existing museum practice needs more research, though it is clear that heritage institutions can provide critical context for the experience. The Waag Society’s strategy in this is to set up more experiments with cultural heritage partners in a long-term programme by the name of Location Based Heritage, incorporating partnerships with artists, heritage institutions and sector institutions. Akkerman, S., J. Huizenga, W. Admiraal (2009). Storification in history education: a mobile game in and about medieval Amsterdam. Computers & Education archive Volume 52 , Issue 2 (February 2009), 449-459. Ankersmit, F.R. (2005). Sublime Historical Experience. Stanford University Press. Boone, M (2004). ‘L’automne du Moyen Age’: Johan Huizinga et Henri Pirenne ou ‘plusieurs vérités pour la même chose’. Autour du XVe siècle. Journées d’étude en l’honneur d’Alberto Varvaro, 27-51. Raessens, J. (2007). “Playing History. Reflections on Mobile and Location-Based Learning”. Didactics of Microlearning: Concepts, Discourses, and Examples. (Ed. T. Hug. Münster: Waxmann Verlag), 200-217. Sassen, V. (2006). Publieke interventies. Open 2006/Nr. 11/Hybride ruimte, 18-27. Social Cultural Planning Bureau (2008). The Virtual Culture Visitor.